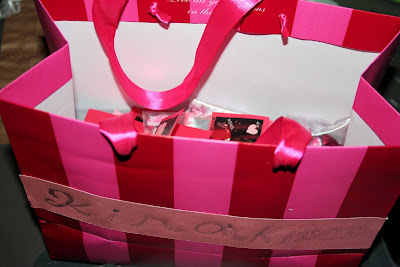 I know you’ve been waiting with baited breath to see what we came up with for Valentine’s this year. The concept came together for my daughter so well, but didn’t translate as well for my son, so I modified it to something he would think was cool. So this is the final product. I started by taking pictures of my kids in front of our red curtain, and did several takes with Kira until I had a picture that really looked like she was blowing a kiss. I got the idea from somewhere in blogland, that you can put labels on Hershey’s kisses. You want the 3/4″ size. I found printable ones at Office Max, by Avery, and they have a Word template you can download online. 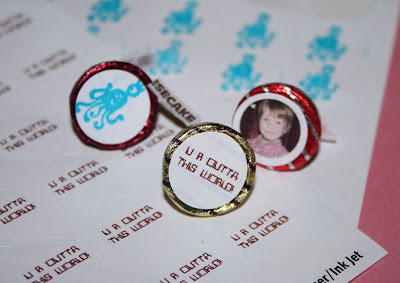 I printed close-ups of my kids pictures on to the labels, some text, and we used these fun stamps from the dollar spot at Target to decorate the rest. They are also the perfect size for these labels. “Kisses from Trenton” just wasn’t as cute as “Kisses from Kira”. And as hard as I tried to find an alliteration that would work (true love from Trenton, Tenderness from Trenton, Tickles from Trenton, etc. ), nothing seemed to gel. I designed the card toppers from the photos I took (I will upload those files with credits to my Digital Insanity Page), and had my kids sign their names on them, using my new Bamboo Tablet (belated Christmas present–yea!) Kira had to approve her design and help add some dots. I bought plastic bags from the jewelry section of the craft store. They are a great size for this, and have a Ziploc-type top. I was planning to keep the design simple and just print each topper on white cardstock and fold them like a tent to seal. For some reason when Office Max uses their heavy cardstock paper it prints a lot of high contrast ink. Kira’s face looked like she had a peeling sunburn. So I went back to the regular weight paper and glued on to folded cardstock. 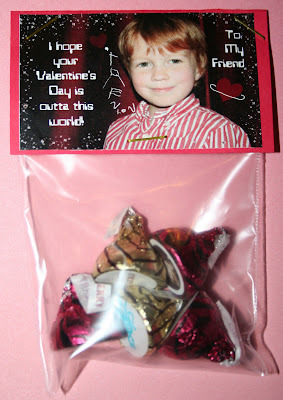 I used some colorful “Close to My Heart” staples to seal each bag of kisses. She made the “Kira’s Kisses” sign. 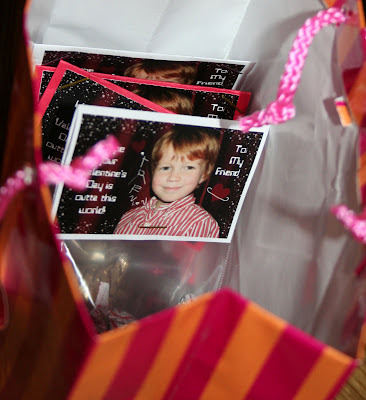 The funny thing is her teacher brought valentines to school in the exact same bag, minus the label. I should note that I am grooming another insane person. Kira stayed up with me until almost 10:30pm getting everything assembled. (It wouldn’t have been nearly so late, if we hadn’t had soccer practice and “triple threat class” that afternoon/evening). I thought they were awfully cute, and fun to do while they are still young (and not easily embarrassed!) and were well received by their classmates. I don’t have a plan for next year, yet, so send me all of your great Valentine ideas! Happy Valentine’s Day! You are soooo cute! I just love to see creativity, but so often I am left thinking “this would have been so much better if they would have taken it a step farther…” But I never think this when I look at your stuff! They little ring around the heart like a planet- that’s the step I’m talking about! 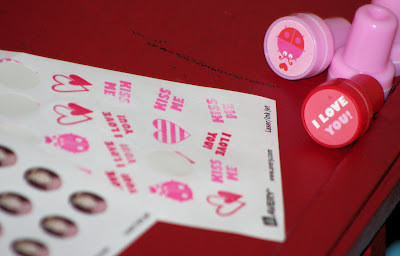 And the little stickers on the bottom of the kisses… I couldn’t say enough! Well done! You are so creative that you’re probably the one looking at my stuff thinking “just one step farther…” lol! Kendra,you are too much!! These are the cutest things ever! Wow! I am so impressed! Love these! These really are cool valentines!I am really impressed! 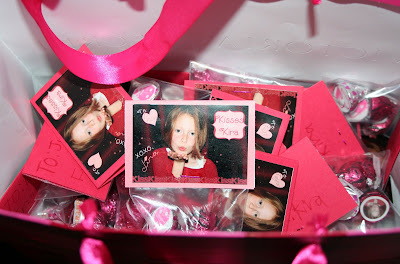 When my kids go to school I will just send them to Aunt Kendra to make the coolest valentines in the class! Just kidding! Love ya sis! Leave it to you lady! You are amazing! These are fabulous! A note went home for the Valentine “rules”-No candy was at the top. I was completely bummed that I couldn’t make the ipod Sweetheart boxes with peanut butter cup ear phones. So much to my dimay, my kids came home with tons of candy attached to their valentines! Why am I such a rule follower? I’m breaking it next year!!! Thanks for the inspiration! Oh they turned out so cute–love them! Super cute! I always love using my kids pictures in my crafts! 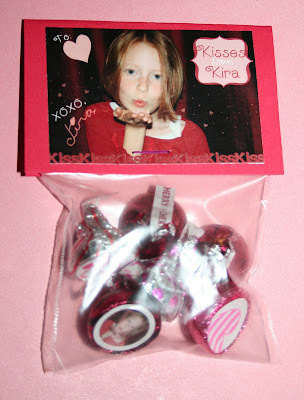 And “kisses from Kira” is too cute! I also like the finishing touch of the images on the bottom of the kisses. It is always the little touches that finish a project off!! Such a cute idea! WOW!